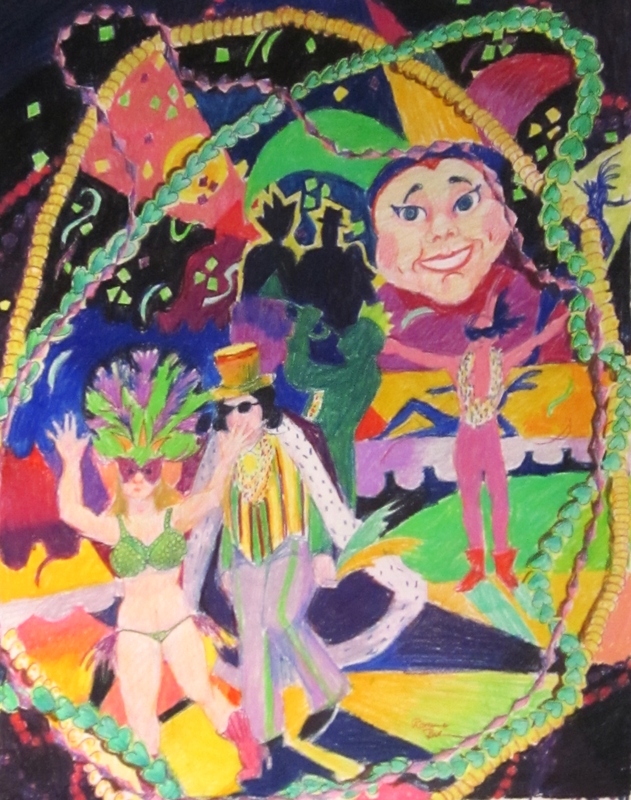 Finished the Mardi Gras drawing, and renamed it “We went to the Mardi Gras”. That’s because, not only is there a not-so-recent drawing of myself in it, I managed to sneak the man in my life, Richard, into it too. So, what’s next? I’m planning a drawing for the raffle at “Pony Rides for a Purpose”. It will be a new take on a winged horse. Also, found a new worthy cause. The idea is that as many artists as possible do a painting of a 4″x4″ canvas to be sold for $56. The pictures are only to be signed on the back…this project has some celebrities participating, and the organizers want it to be a surprise to the buyers. So, I won’t post the picture here, only a link to the website, and you can guess. I don’t have an idea yet, and I’m not sure what medium I’m going to use…maybe time to break out those oil paint sticks that I bought but never used. Previous PostA TributeNext PostBusy, busy, busy….what’s a woman to do?